I really like the sound of this amp. --Gene Rubin. Gene Rubin Audio. This hybrid design incorporates a pair of 12AX7 tubes for the MM phono section (1.7mV sensitivity) and a single 12AX7 driver for the MOSFET outputs (40W/channel). TUBE AMPLIFIER. Sold for restoration only and as long as it's untouched and all original it can be modified. Has Output Tubes. As Pictured. H.H. 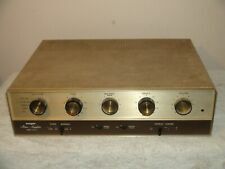 SCOTT LK-72 Tube Integrated Amplifier Amp Telefunken w/Wood Cabinet Nice Excellent Condition, Works and Sound Great. Comes With Original Tubes Including Telefunken 12AX7. Otherwise, 7591 Tubes are Mixed Brands. Cabinet is in Excellent Condition with Light Mark. It is in Working Condition But Selling As Is with No Guarantee Due to Its Ages. Final Sale No Refund or Return. ?? ?email or Text8183141658. Stereo RCA audio input. four power amp tubes (4 x EL84EH). three preamp tubes (1 x ECC83, 2 x ECC82). digital audio inputs: 1 USB (Type B), 1 optical (S/PDIF), and 1 coaxial (S/PDIF). detachable AC power cord. Single-Ended Triode Stereo Integrated Amplifier. The Wright Audio Royale SE Series 2 Integrated Amplifier is an 'all-in-one', single-ended, triode-connected tube stereo amplifier. The Royale SE Series 2 Integrated Amplifier provides greater clarity and more dynamics than other tube single-ended designs. Vacuum Tubes: 6L6 6P3x4 6N1x2 6N2x2. Frequency: 20Hz~40KHz±1dB. Output Power: 22W×2. Power Dissipation: 135W. Headphone Output Power: 200mv. Used condition. In nice condition. What you see in the pictures is what I have. Serviced - Working. Clean all tube sockets. Includes Four Mullard Tubes. Great Sound. Replace 5AR4 rectifier with new JJ type. HEATHKIT AA-100 TUBE AMPLIFIER. WHAT YOU SEE IN PICTURES IS WHAT YOU WILL RECEIVED. Roth Music Cocoon MC4 Stereo Tube Integrated Amplifier; MC-4; iPod Dock; Remote. Condition is Used. This is a 110v unit. This is a beautiful example of a EL34 based integrated amplifier. New Mullard EL34 Power Tubes and Millspec driver tubes. This is a Class A amplifier. 80 wts per ch in ultra linear and 40 wts in triode. US Made Cary Audio SLI 80 Tube Integrated Amplifier. Unison Research Unico Hybrid MOSFET Integrated Amplifier in excellent condition. Comes with remote control, power cable and user manual. Also comes with a pair of upgrade Mullard CV4003 tubes. Fully recapped and with an upgraded 3-prong grounded power cord, this DuKane Model 1B670A Mono Integrated Amplifier is ready for another five or six decades of use! Tubes have been tested and are all good. YAQIN MC-50L KT88(6550)X4 Push-pull Integrated tube amplifier. SRPP preamp circuit and ‘LONG END TYPE’phase inverter circuit widen frequency response and lower distortion. KT88(6550) tube as power tube. Very rare Stromberg Karlson Custom 400 integrated tube amplifier.Working. Will arrive not DOA, but no warranty ,"AS IS". Up for sale here is a Ketch Audio MDI 3805 A integrated amplifier. Two 300B triodes drive a pair of 805 triodes for 45 watts of power. Since most triodes usually kick out only a few watts of go juice. Stromberg Carlson, Mono Tube Amp. Lettering off on “Stromberg” part of attached lettering. 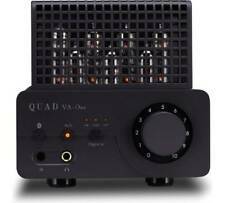 AR-419, 20 watt tube amp, integrated.